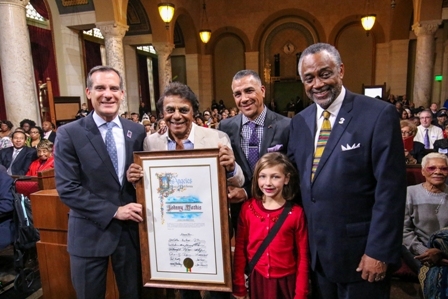 Legendary singer Johnny Mathis was presented with a Lifetime Achievement Award by Los Angeles Mayor Eric Garretti and Our Authors Study Club, Inc. to kick off Black History month celebrations. 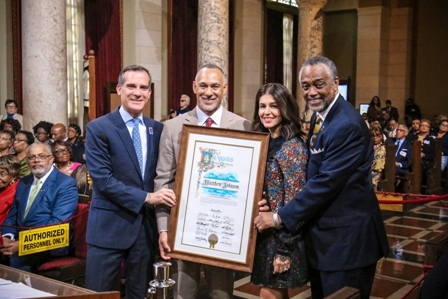 The Hall of Fame honorees included U.S. District Judge Andre Birotte Jr., Michelle King LAUSD Superintendent and Matthew Johnson Los Angeles Police Commission President. Each was recognized for their community achievements. 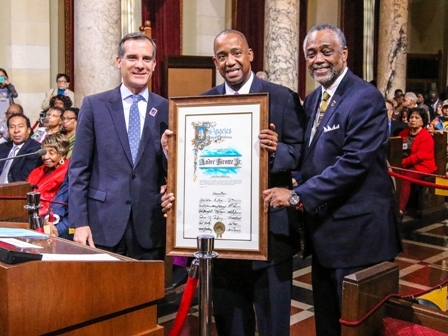 Before a standing room only crowd in council chambers, the annual ceremony was co- hosted by members of the Authors Study Club and the Los Angeles chapter of the Association for the Study of African American Life and History. He described his father as a singer who raised seven children along with his mother. 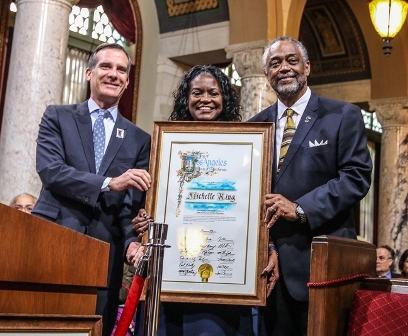 Michelle King, 54, the first African-American woman to hold the superintendent post, was “so thrilled and excited” sitting next to two legends Johnny Mathis and Dionne Warwick. She felt a sense of professional honor as well. “Matthew Johnson, Los Angeles Police Commission President, 50, was humbled too. As his name was being call, he remembered that public school kid from New Jersey that no one expected much from and yet here he is being recognized among this special group of honorees. Yasmine, his wife, was “incredibly proud of him.” She said his heart is 100% invested into service to this community. Perhaps most surprised was U.S. District Judge Andre Birotte Jr.
Judge Birotte, Jr., 50, took a break from his busy court schedule to receive his award. Ironically just a few hours earlier the Federal judge had just granted a temporary restraining order against the executive order President Trump signed. The Ruling was against Trump’s controversial suspension of travel from a group of predominantly Muslim countries. Later the festivities moved to the South Lawn of City Hall where Mathis was serenaded by R&B vocalists. Among them were Howard Hewitt, Deniece Williams, Dorian Holley and others. Mathis surprise those in attendance when he stood up joined legendary jazz/blues vocalist Barbara Morrison in a duet.